Nokia is working on a podcasting app for its S60 N Series smartphones. The initial release focuses on providing a mobile podcasting client that will be able to manual and automatic updates of podcasts over 3G or WLAN networks. 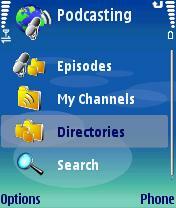 However, Nokia plans to develope the application to be a mobile podcast publishing platform. “The ultimate focus of the Nokia Podcasting Application is the world of Podcasting‚Ä¶ search, discovery, preview, download, listen/watch, create, edit and uploading,” adds Stewart. The release date is expected to be sometime in July, and will be a free download.